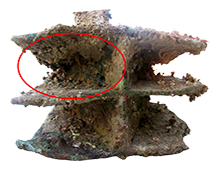 Artifacts recovered from the Battle of the Egadi Islands archaeological site brings forth the first direct archaeological evidence for warship tactics in the 3rd century BCE. Tactics included the types of armament employed, fleet compositions, and fleet tactics during the battle. The evidence from this site indicates a battle where ramming was the primary operational tactic utilized. Initial naval engagements of First Punic War highlighted the Roman’s deficiency in training, experience, and warship operations compared to the Carthaginians. Ramming tactics had held sway for centuries and in these speed and maneuverability were essential; two benefits of excellent training, experience, and warship operations. 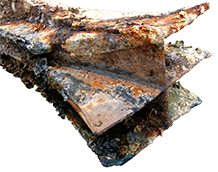 Ramming tactics, both frontal and blows to hulls are supported by finds from the Battle of the Egadi islands. 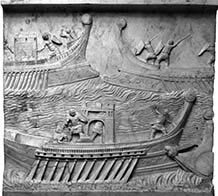 One of the misconceptions perputated by popular works is that the Romans typically utilized boarding bridges to “simulate” land battles at sea. 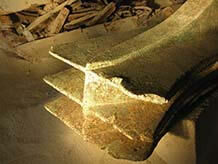 The short-lived corvus was developed by the Romans and employed by 260 BCE in naval engagements with Carthaginians. This device was used to augment ramming tactics, typically after the initial clash. In effect it was a boarding bridge that affixed to the deck of an enemy ship by means of a large spike. Not only did this nullify the speed and maneuverability advantages of the Carthaginians, it allowed ships to be captured with little damage. As Carthaginians increased vessel speed and refined their ramming tactics, as did the Romans, the corvus was rendered ineffective and fell out of use after 250 BCE in favor of ramming tactics. Afterwards the breif experiment of the corvus was forever abandoned; the Romans continued to utilize ramming tactics augmented with projectile weapons that were the common suite of tactics in the ancient Mediterranean through the remainder of the war and the following centuries. Tactical formations varied due to circumstance, objectives, and the tactical armament utilized. At Ecnomus in 256 BCE, for example, the Romans warships equipped with the corvus had appropriate formations for tactical operations. In the front, the Roman’s formed a wedge formation: a line of warships trailing back from the two largest lead warships, and finally a dingle line of warships to form the base “, so that when these ships had taken their places the resulting form of the whole was a triangle.” Polybius, I.26.7.13-14 (Paton, W. R., 1954, Loeb). Behind this giant ‘spear head’ the Romans placed the horse transports to ensure maximum protection. The final formation was a single line of ships behind the horse transports that was wider than forward formation. The Carthaginians, who favored ramming tactics, countered with three quarters of their fleet in a single line that extended out to sea as their right wing. On the left wing the other one quarter of their fleet was drawn up to form an angle to the main line. 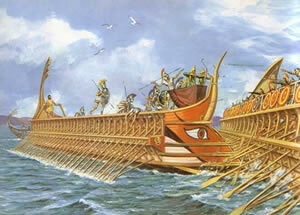 A different set of tactics was favored by these antagonists at the Battle of the Egadi Island in 241 BCE. No longer equipped with the corvus, the Roman fleet opted for a direct full-frontal ramming assault. Per usual, and with little time to react, the Carthaginians offered the same tactical formation. “When [Gaius Lutatius] saw the Carthaginian ships under full sail he at once got under weigh,…he brought his fleet into a single line with their prows to the enemy…The Carthaginians, seeing that the Romans were intercepting their crossing, lowered their masts and cheering each other on in each ship closed with the enemy. The Carthginians, seeing that the Romans were intercepting their crossing, lowered their masts and cheering each other on in each ship closed with the enemy.” Polybius, I.60.9-61.1 (Paton, W. R., 1954, Loeb). After the initial head-to-head ramming to open the conflict, which undoubtedly disabled some ships, the conflict continued with attempts to ram enemy hulls that resulted in the sinking of over 50 Carthaginian warships. 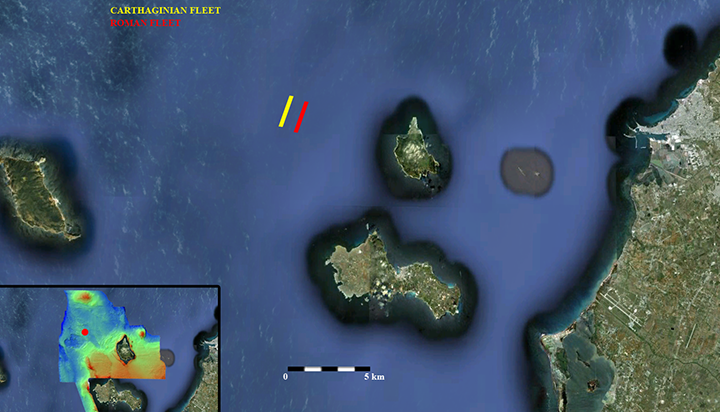 Archaeological evidence from the Battle of the Egadi Island archaeological site supports several aspects of naval warfare in the 3rd century BCE that are attested to in the ancient sources. As more evidence comes to us from this site, further light will be cast on the operation of warships both in battle, and in routine transit operations. The Battle of the Egadi Islands, like that of most sea battles in the First Punic War, were open-sea battles carried out away from shore where speed and maneuverability were the critical tactical features of the warships and crews. However, during the Hellenistic Period in the Eastern Mediterranean there were a larger number and greater concentration of large port cities. Attacking these port centers was a strategic necessity and the warships’ functions relied more on size and providing large platforms; the warship designs and fleet compositions also reflect these different strategic and tactical considerations. For a thorough discussion of the Eastern Mediterranean at this time see Murray’s The Age of Titans. Copyright © 2019 RPM Nautical Foundation · All Rights Reserved · Website powered by BizBudding Inc.